Last weekend was the annual Allergy and Freefrom Show in London, one event that has been pencilled in my diary since we visited it for the first time last year. This amazing show features a multitude of companies and charities who provide goods and services for those struggling with a life with allergies. From the well-known brands to smaller businesses who have only just started out, the stalls offered both G and M the opportunity to taste and try a range of safe foods and drinks. This year we visited on the Sunday, hoping for a marginally less hectic day there than the one we experienced last year. We arrived before the doors opened and despite joining the long queue that was forming outside, the sensible decision was made to open the doors slightly ahead of schedule and we were inside the hall in no time at all. As soon as we spotted the map, we ran our eyes down the list of stall-holders, noted the location of our key stalls to visit and formulated our plan. I wanted to see as many of the allergy stalls as possible, hoping to find some more M-friendly products to add to our cupboards. Mike and G declared themselves happy with just wandering around and tasting whatever free samples were on offer and M had 2 specific requests for the day – Ms Cupcake and Allergy Adventures. 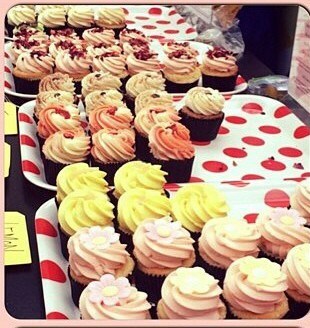 M often talks about the decadent cupcakes that he enjoyed at last year’s show, which were revolutionary for him as he hadn’t had such a large choice of cakes to choose from since before his diagnosis. All of these cakes are vegan and some are baked to be gluten- and soya-free too. He remembers well just how large these treats were and had discussed at length that he thought it best if this year he and G chose one to share rather than one each. Needless to say, the reality and temptation proved too much and all his plans went out the window the minute he laid eyes on Ms Cupcake’s stall. M chose a Black Forest cupcake and a choc chip cookie sandwich, whilst G had a wider choice and settled on a Chocolate and peppermint cupcake as well as a choc chip cookie sandwich. As they started on their mouthfuls, I asked for their opinions as to the taste, but they had no comment to add as their mouths were crammed full – a true sign of just how delicious they are! We made our way around the myriad of stalls, tasting tidbits, chatting with stall-holders and discovering some wonderful new products to add to our M-friendly repertoire. I picked up some old favourites, such as Nakd bars, Frank* bars and Newburn Bakehouse wraps, at amazing show prices as well as finding Le conserve della nonna pesto and Free’d crackers, which I’m hoping will quickly become new staples in our home. There was a lot of gluten-free items on offer, but we struggled more this year with what was available for those with multiple food allergies, which was disappointing given that forms the basis of our allergy needs. 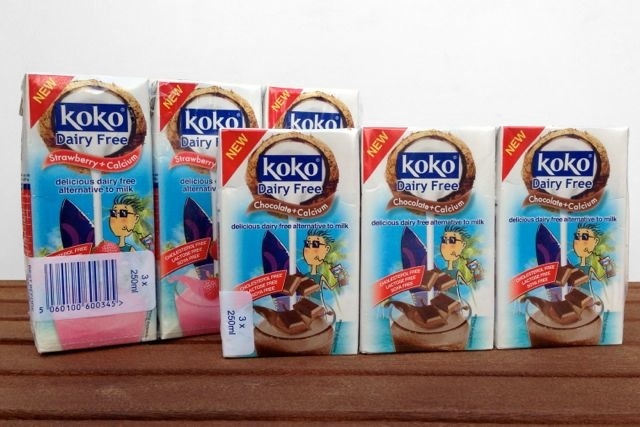 All that being said, we came home with a carload of M- and G-friendly foods, including enough KoKo Chocolate and Strawberry flavoured coconut milk to last us at least a couple of months! It was a long day, especially after our amazing day out at Silverstone on the Saturday, but I’m glad we made the detour from Northamptonshire to London to experience the show. Everyone there was helpful and informative and I had no problem in identifying what M could and couldn’t try. This is definitely a trip I’m planning to make again next year and one I would highly recommend to anyone living with allergies. Even better, if you live further North in the UK and don’t fancy the trek to London, there is now the Liverpool show to enjoy in October and you can find out more about visiting that here. This entry was posted in General and tagged allergic reaction, Allergy, Allergy Show, Awareness, Dairy free, Egg free, Food, food allergies, Free from Show, gluten-free, Gluten-free diet, home cooking, parenting, Soya free, Special Diets, wheat free on July 10, 2014 by bluesingingdragon.